Google Wave has been accused of being a way to make people feel like how older people feel when they use the internet. I definitely found this to be true during my first couple of weeks using the platform. The volume of stimuli received even in a three-person wave can be pretty overwhelming. I figured that I'd need to write a little Wave gadget before I actually grokked the platform. 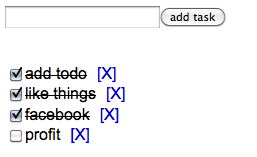 I figured that a to-do list would be somewhat useful and fairly simple to code up. I built this thing up one day on my lunch break. Here's a link to the gadget for your consumption. I've started a public wave for feature requests and discussion and such. Continue reading "On Writing a Simple Google Wave TODO List"